I think it's safe to say that there is no other casino software developer to release new games with the pace of Microgaming. The Isle of Man based veteran casino solutions provides extends its already considerable game library with at least one new title each month, but sometimes the number of new releases can rise to two, three or even more. For May and June 2015 the developer has plenty of new and renewed titles for us: Ariana and the Big Chef will be released in May, along with the browser remake of the classic Adventure Palace video slot, while in June we'll have the pleasure to welcome titles like Hound Hotel, Kitty Cabana, Pistoleras and the HD remake of the classic video slot Avalon. The games will be found at one of the Microgaming powered gaming outlets online. In May 2015 the developer will release three new titles: Ariana, the Big Chef and the remake of the Adventure Palace video slot. Ariana will take its players on a journey to the depths of the sea, exploring the secrets of a coral reef with the attractive heroine of the high seas called Ariana. The five reel, three row video slot will come with 25 fixed win lines, and will have an artistic, high definition theme inspired by the relaxing, deep blue seas. Lucrative free spins with stacked wilds make the game complete. The Big Chef slot machine will take the player on a trip to discover the secrets of fine dining. This new five reel, three row video slot with 15 win lines has a cartoonish theme, featuring chefs, waiters and tasty dishes on its reels, and offers a new feature called Rising Wilds. Adventure Palace will take players on a journey to India, in a jungle adventure featuring monkeys, cranes, tigers and elephants. The game has five reels, three rows and nine win lines, and will get a high definition widescreen makeover and become available for browser play as well. 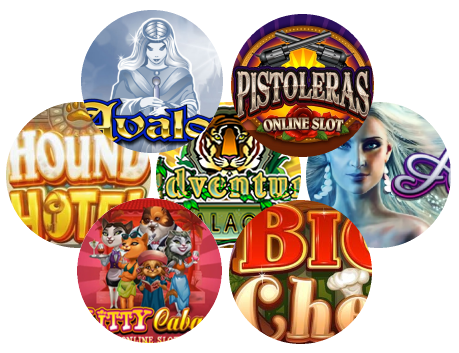 In June Microgaming has three new, original slot machines for us. Two of them, Hound Hotel and Kitty Cabana will be basically the same game, with five reels, three rows and 25 win lines each, but with a different theme for dog enthusiasts and cat lovers. The games will come with an incredible variety of wilds - expanding, dashing, stacked, split and so on. Both games will have cartoonish graphics, funny animations, and will offer loads of entertainment - and wins - to their players. Pistoleras will be a wild west themed video slot machine, taking players on a journey to a small town with three attractive gun wielding beauties. Aside from the free spins, the game will have a bonus game - a shootout at the saloon, where players will need to match three Pistoleras to win a bonus amount. The final game announced by Microgaming for a July release is Avalon HD, the remake of their classic King Arthur themed game. The players will have the chance to join the knights of the Round Table in a new widescreen format, and play the classic game with improved graphics, sounds and interface, with added spin stop and gamble features. Meet the Lady of the Lake and find the Holy Grail with the improved version of the fantasy themed Avalon.